Byeongbangchi Observatory is located in the between Gyuram-ri and Buksil-ri in Jeongseon-eup and features breathtaking views surrounding Bamseom Island whose shape is like the Korean peninsula with streams of Donggang River. 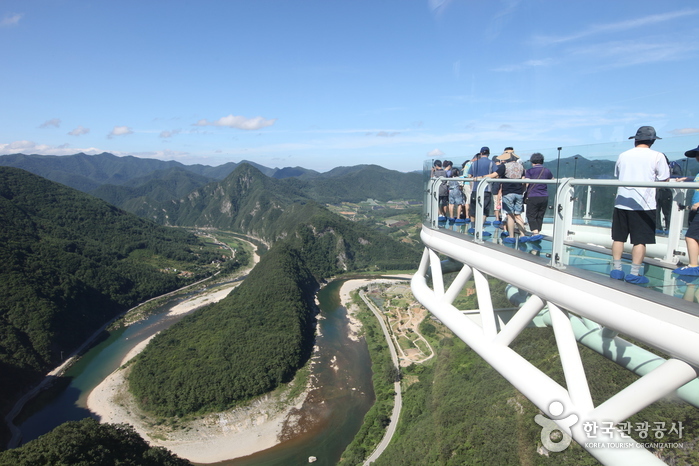 Byeongbangchi Skywalk experience offers a thrilling experience as it gives a feeling of walking in the sky thanks to the tempered glass on the ‘U’ shaped structure (11m) projected from the cliff at an altitude of 583m. From this observatory, tourists can see the beauty of Bamseom Island and Donggang River, making it an attractive point to visit.